I totally love my job! This last weekend my studio mate, Cass Mullane and I had the honor and joy of teaching an Adduce class at Cottonwood Center for the Arts. The Adduce Foundation funds a community art education enhancement program. This amazing program is offered to qualifying high school arts students. Classes are free for the students and cover a wide array of media and techniques. Cass and I were thrilled to present the very first textiles class for the foundation. We weren't sure what to expect and we were totally blown away by the talent and enthusiasm of the students. It was amazing to watch them jump into a totally new medium and start exploring with no fear or trepidation. They each brought their unique voice and style to textiles with fantastic results. Best of all they loved it! Part of the program is an art show in May. I can't show you their final pieces (except for the little peek in the last photo) until then but I have a few photos from the class to tide you over. I have two cures for Winter in today's blog! I am teaching at Art and Soul just out side of Kansas City in just a few weeks (March 19-23) and I had a request to add a textile journal book class. We put up a class I have taught previously but some students had requested more of a usable journal. I love making books and so I was able (used this as an excuse) to spend some this week creating a new fabric Journal. Is that not awesome? I just love how it feels in my hands. I think I am going to have to make more of these. Want to join me in Kansas City? There is still room in most of my classes. I can't think of a better way to get away from winter then to hang out in a beautiful resort making art and making friends with people who love making art. Students will get to choose between these two styles of fabric books...or maybe we will make up something new! You never know what interesting things we are going to create in my classroom. There is still room in my Mexico Travelogue Art Adventure. April 13-19, 2014. Did you see my newest video? My son is helping me join the vlog (video blog) world. Nagging might be a better word than helping...he wants to come with me on these trips as my videographer. Anyway, I did a fun really short video and I had a blast making it. Suscribe to my YouTube channel to see the latest ones...I have a studio tour premiering this week! I am thrilled to announce that I am a participating teacher for this year's Angels in My Studio on-line workshop Series! Guess what else? I have a spot to give away in the class ~ details below! This amazing 5 month workshop series is being taught by 11 talented mixed media artists. Just look at this line-up! Chris Zydel -- Something super magical is in the works, guaranteed. Melissa Muirhead -- Sweet, sweet angel pendant on a Scrabble tile! "I realize that it doesn’t really matter if angels are “real” -- what matters is the very real experience of clarity, ease, calmness and support we feel once we invite in the possibility. When you allow the possibility of angel magic into your life, everything shifts. Everything. When you allow the possibility of creative play into your life, everything shifts. Everything." My class is all about trusting your intuition. We are going to create a really cool talisman to wear. I am so excited about this project! You can learn all the details about the workshop, teachers, projects and register on the main Angels in My Studio web site. If you find out about the class from me please use the link here to register so we know where students found us as this is how we are paid. Ok, so on with the giveaway! You will have to leave a comment to enter of course. Tell me which of the lessons you think is most out of your comfort zone and will help you stretch your creative and intuitive muscles. I will use a random number generator to choose the winner on Sunday June 2. I spent the weekend immersed in words. I love words! I love writing them, reading them, thinking about them, understanding them...if you love words you understand. My purpose for this word absorbing session this weekend was to slow down and making time to think about my students and customers. How can I help them, what do they need, what do they want, and how can I best share my knowledge with them. I don't usually make the time to spend two whole days on planning. But, I realized that with my word of the year ACTION I could benefit from some planned action instead of just reaction. Reaction usually just has me putting out fires and making more chaos in my life. Do you ever take the time to step out of your normal routine and focus on your goals? I felt totally energized and ready to take on the world after my introspective weekend. How does it make you feel? One idea that came out of my brainstorming session was simply to ask you! What do you need? What are you looking for? What sort of classes do you want? Leave me a comment or e-mail me. A lot of other ideas came out of my quiet day of thinking and writing. I have lots of ideas for new classes including video classes and some new books. Now, I have to gear up into production mode so I can deliver all these fun ideas into the world. Speaking of classes, I am back teaching on-line at Fiber Arts Mixed Media with my Layer it Up! collage class. Lots of fun techniques and some solid guidlines to teach you how to create great collage stories. Plus you get to learn at home! You can learn more about it or sign up here. I am surrounded by studio chaos! That is how it is when I am fleshing out a new class. Creating a new class often takes up to 6 months of thinking, experimenting and talking to the dumb little scoundrel that whispers in my head. I thought I might share with you my process for developing a class. We made a bit of a mess everywhere as we learned how to transfer images and emboss. But what is creativity without a mess? We played with thin metal shim-colored and natural too. We took full advantage of the amazing warehouse space to spread out our work as our patinas developed. It is much easier to work with Liver of Sulfur indoors when you have a really big space...not quite so stinky! Most of the students had never used a torch before but once they tried it they were hooked! Many thanks to Carol Hamilton for allowing us to use her torches and for the safety lesson for everyone. Carol is an amazing jewelry artist. Check out her gallery. I have a new piece that features metal mesh but it is for a special exhibit so I can't even give you a sneak peek yet. You will have to take my word that it is beautiful. :-) I am off to Barcelona Spain tomorrow to teach my three day intensive thread class, Stitch Journeys. When I get back I will catch you up on Art and Soul as well as my trip to Spain. I have long been a fan of assemblage art but have not taken the leap yet so I was delighted to be able to introduce Leslie Brier to you. As an avid collector of cool stuff that might come in handy some day I fear for my pending storage space problem after looking through Leslie's blog. My husband doesn't understand my why I keep bringing home more rusty stuff but, how can I throw anything away now? 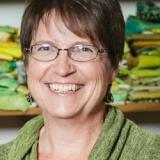 Leslie's work has been featured in Somerset, Cloth, Paper Scissors and Inspired Ideas. What type of classes do you like to take at Art and Soul? When I first went to Art and Soul, I took classes where I felt I could be successful and come home with a nice, finished piece. Then, I took a class that really pushed me out of my comfort zone, and I realized that I could learn a lot by being brave. I didn’t always come home with a perfect, finished piece of art, but the skills I learned were invaluable, and I found ways to incorporate that new knowledge into my work. The classes I’ve taken at Art and Soul have really helped me to grown as an artist. What aspect of teaching do you love the most? I am amazed that a group of students can start with virtually identical materials, and within a few hours, an amazing variety of work will be created. Each student interprets what you teach and puts their own spin on it. I also love the fact that teaching doesn’t feel like work! I end a day of teaching feeling energized and inspired. That wasn’t always the case when I was working in the corporate world. Do you work in a planned or intuitive way? How would you describe your approach? I start out with a plan, but it is rare that a piece ends up exactly as I originally intended. I work with found objects and I find that they once I get them into my hands, the objects themselves will lead me in directions that I hadn’t thought of in the sketchbook phase of the project. What did you do to discover your creative voice and personal style? I did jewelry and graphic design for a long time, but my heart was leading me toward assemblage. I was afraid of ruining the objects I wanted to use in my art. I also was used to charging by the hour for my graphic design work, and I didn’t want to put a lot of time into a piece that might not turn out the way I wanted it to. I had to overcome those fears, and give myself permission to fail. Eventually, I realized that no time spent in the studio was wasted time Taking the time to develop my own techniques has been invaluable. I learned to trust my instincts, and that’s when my own individual style emerged. What advice do you have for someone beginning their art journey? Dive in! Be fearless! You have absolutely nothing to lose, and so much to gain. Allow yourself the time and space to practice what you are interested in. You didn’t learn to read or write in one day -- it took time. The same applies to your artistic skills. Also, seek out like-minded people. I remember going to my first Art and Soul, and how good it felt to be surrounded by people that were interested in the same things that I was. You can take a class from Leslie to learn all about her creative creatures at Art and Soul in Va Beach in March! We have another giveaway for you! Another chance for one of Artistic Artifacts awesome mixed media prize packs including some fabulous batik fabrics and lots of ephemera. Leave a comment below...share your favorite place to find awesome stuff for your collection! Come on Share! There is plenty of great stuff for all of us. We won't buy it all! Just before I headed to Portland for Art and Soul earlier this month I had a little side trip to Salt Spring Island BC to take a class from Nick Bantock. My husband came along for the adventure and let me tell you...getting to Salt Spring is an adventure all by itself. We spent countless hours trying to figure out the least expensive way to get there that involved the fewest ferry rides. We also made a side trip to Portland to drop off my extensive classroom supplies for Art and Soul. Crossing the border with a car packed to the gills with art and supplies is bound to end up with us in the little back room. We arrived a day and a half before the class so we could explore the island and hike. It was amazingly green and lush. I grew up on the east coast (VA) and my husband grew up in the South (Louisiana and such) so we thought we knew what to expect but we were completely amazed at how wet everything was. The sun did shine for parts of a couple days and of course everyone on the island said it hadn't rained for weeks and weeks before we got there...isn't that always the case? One of our hikes lead us to this grove of Gerry oaks. They looked like Colorado gamble (scrub) oaks gone wild! So it was familiar and yet a strange environment we explored. The Gerrys are behind the pine tree in the photo above. I don't take many classes these days mostly because my schedule is so full. I almost didn't sign up for this class with Nick Bantock but am so glad I did. It was incredible. I have long admired his collage work and of course am completely drawn in by the way he weaves his art with story. Our two day class was split evenly between his philosophy of making art, what it means to be an artist and techniques. Nick has that rare talent in a teacher to ask the questions that need to be asked in order for you to grow as an artist or even as a human. My fellow students were a great bunch and everyone created wonderful work but I am sad to say I didn't get any photos! My piece is not ready for prime time yet...it is still evolving. I will share it when it is finished.